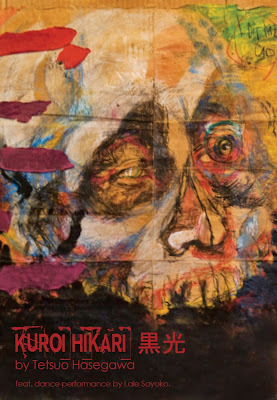 Contaminate NYC is pleased to present the solo exhibition of Japanese painter Testuo Hasegawa , along with a performance by Japanese avant-garde dancer Lale Sayoko, at Ward III in Tribeca on May 12th, 2010. The ongoing exhibition will last until May 21st, 2010. The exhibition title Kuroi Hikari – the black light – gives an unmistakable mark to Testuo’s painting production and his deeply original style. Technically, the black light is the UV light often referred to as the Wood’s Lamp: if exposed to colors it alters them to their extreme saturation. Inspired by this concept–and through his psychedelic view and distinct sensibility and mastery with colors–Testuo tackles the most grotesque, sad and obscure subjects, saturating them with a fierce philosophy of freedom and irony. Yet, Kuroi Hikari also represents the contrast of two opposites: light and shadow, Good and Evil, life and death. Hence, two different creative currents underlay this Japanese artist’s work, mirroring perhaps his two ambivalent intimate personalities and making him indisputably unique. In a shining performance created specifically for the evening, outstanding dancer–and Testuo’s dear friend–Lale Sayoko will interpret these polarizing forces to an extraordinary climax during an evening that you don’t want to miss.